Welcome y’all! 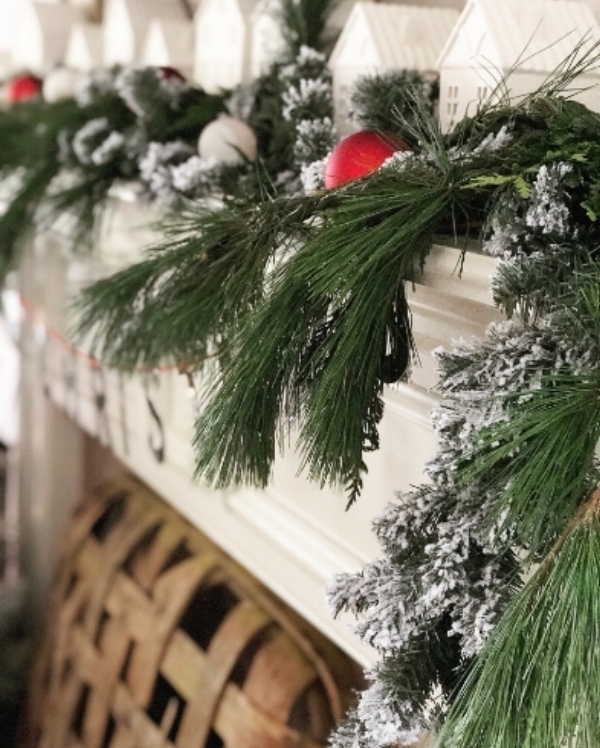 It’s a joy to have you visit our home today on “Favorite Christmas Room: 12 Inspiring Tours.” If you are coming from Lindsey’s, Revive and Design, wasn’t her kitchen amazing?! Lindsey is so talented and offers great inspiration. Thank you for continuing on with the tour and joining me in our entryway and living room. Grab your coffee and a cozy blanket and join me as we tour my space! When you first walk into our home, you can hang your belongings on this coat rack that sits below a gallery wall of collected signs from mostly small shops. We turned a teak wood outdoor bench into a bright indoor one by using Annie Sloan chalk paint to bring it to life and add some color to our overall neutral décor. Speaking of color, I enjoyed working with neutrals in my seasonal décor by adding splashes of red for a festive emphasis this year. The bench holds plenty of pillows and has a large found dough bowl from a pickin’ event leaning against it. In front of you stands another found item, that chippy white table that holds an architectural piece (corbel) and a collection of bottles. Collections are a great way to get that time-worn look! For Christmas, the greenery (garland and Christmas tree) adds a perfect layering to my everyday décor. As you come on into the living room area, take off your shoes and stay awhile on these sofas. I try to keep plenty of blankets to wrap around you during the winter months, at least one on each sofa and our chairs. You can also store blankets in baskets below your coffee table or by your fireplace. It's a place to enjoy time with our family and friends over the holidays, talking, and watching holiday shows/movies together. The mantle is adorned with white ceramic houses from Target and again, both fresh and faux greenery. I decorated my mantle this year with the primary intention of hiding all our electronic cords, that you can read more about here. Below, a tobacco basket mixed with the whimsical Santa blend well for a well-layered look. On the wall is a metal shelf containing a mix of both farmhouse elements and seasonal décor. These shelves carry the splash of red too: the little houses, handles on the olive buckets, and the background of the nativity woodblock print. I started off the season with real greenery draping across the front of the shelves, but due to the greenery wilting, I took it down. It is my recommendation to spritz with a water bottle, your fresh greenery every other day to keep it from doing this. I hope you enjoyed your time here in our entryway and living room today. It was a delight having you, and as you move on to the next room over at Noting Grace, Jen’s bedroom, I hope you know how grateful I am that you spent time with me today! Blessings of good tidings and great joy this Christmas from our family to yours! Enjoy these other beautiful rooms in the tour by clicking on the links below.